I wanted cookies a few nights ago, and I wanted them fast. I had a bad craving. This ruled out rolling and/or shaping dough, and it also ruled out butter. 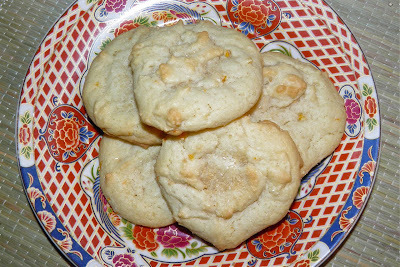 I find butter cookies take longer to make because you have to cream the sugar and butter together until “light and fluffy.” That means beating for at least 5 minutes. Strange dough. This little bit made 36 cookies. Every second was precious. It was getting late. That meant oil and drop cookies. Cookies made with vegetable oil? You bet. Many sugar cookies have tons of butter, and are delicious, but there are recipes that are equally as good that call for just oil. Maybe not as rich, but just as tasty. Sugar cookies have been around for quite a long time. 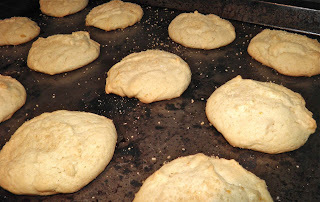 In the 1700s, German protestant settlers in Nazareth, Pennsylvania were baking a cookie called the Nazareth Sugar cookie. Of course they brought this tradition from the Old World, but modified what they were used to making. More than likely the progenitor of the sugar cookie was an unleavened “cookie” called a jumble. They came into being in the 1600s. Jumbles were often rolled into strands and then shaped into circles or even knot shapes, much like pretzels and boiled. These cookies were then able to be dried and stored for many months. They were introduced to Europe by the Moors in Spain as a savoury rather than a sweet, and may have their origins in the Middle East. There is some evidence that the Moors may have picked them up from the Italian cimabetta. So blame the introduction of the sugar cookie on conquest and trade. It’s come a long way to its now favourite childhood place – the plate, beside a glass of milk, left out for Santa Claus. These particular cookies are flavoured with vanilla and orange rind. The orange gives them just a hint of citrus flavour. 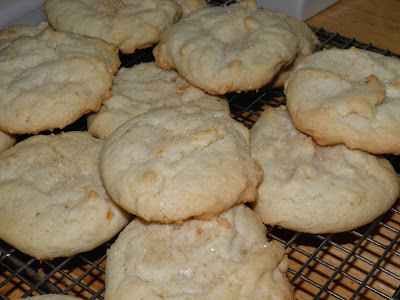 These cookies also have one property that isn’t all that common in sugar cookies. I named these cookies “fallen angels” because they were so rounded when they first came out of the oven but collapsed shortly after, as I hoped they would. Even when collapsed, they somehow retained a light, yet chewy, texture. Amazing! Give these cookies a try. I’m sure they’ll become one of Santa’s new favourites. Sift together the flour, baking soda and salt in a bowl and set aside. Combine the oil and both sugars in a mixing bowl. Beat until light coloured, about 3 minutes. Add the eggs, one at a time, beating each one in well. The mixture will get much lighter. 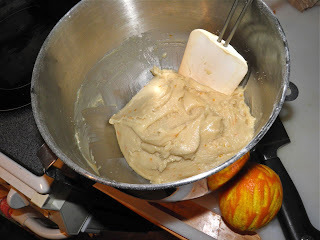 Stir in the vanilla and chopped orange rind. Slowly stir in the flour mixture, a third at a time, until all incorporated. The dough will be almost like a putty. This is good. 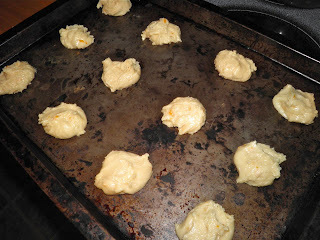 Drop by heaping spoonfuls onto baking sheets, about 12 cookies per sheet. Sprinkle the top of each cookie with large grained sugar. Bake in the centre of the oven for about 10 minutes. Take them out when the edges are just barely starting to brown. The tops will be quite rounded and puffy. Remove the cookies to a rack. As the cookies cool they will collapse slightly.